Near Hierapolis, in Phrygia, there was a place called Chonae (``plunging''), and in that place there was a spring of miraculous water. 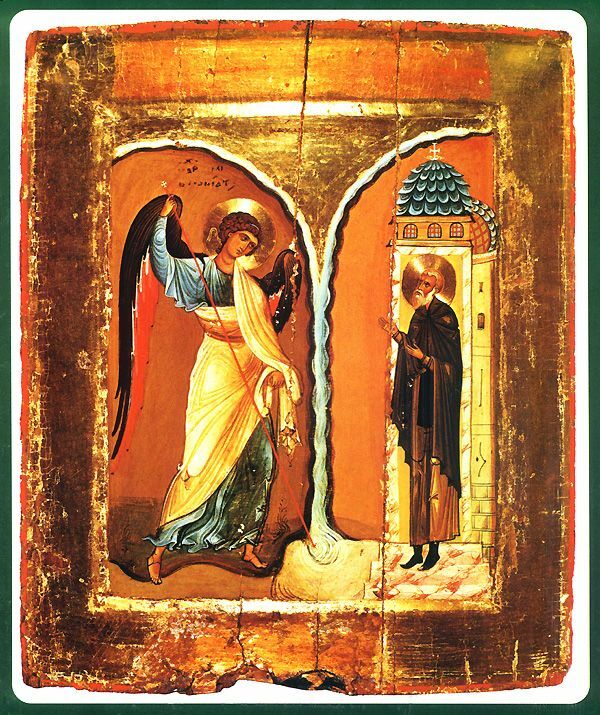 When Apostle John the Theologian, accompanied by Philip, preached the Gospel in Hierapolis, he looked upon that place and prophesied that a spring of miraculous water would open up there, from which many would receive healing, and that the great Archangel of God Michael would visit that place. Soon afterward, this prophecy was fulfilled: a spring of water burst forth and became widely known for its miraculous power. A pagan in Laodicea had a daughter who was mute, which caused him great sorrow. Archangel Michael appeared to him in a dream, and told him to take his daughter to the spring, where she would be cured. The father immediately obeyed, brought his daughter to the spring, and found many people there seeking deliverance from various infirmities. These people were all Christians. 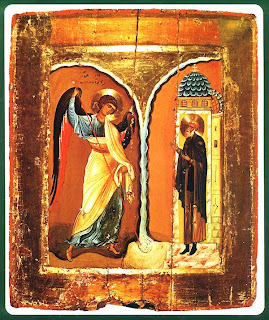 The man asked how he should seek healing, and the Christians told him: ``You must pray to the Archangel Michael, in the name of the Father and of the Son and of the Holy Spirit.'' The man prayed in this way, gave his daughter a drink of this water, and the girl began to speak. The pagan, his daughter and his whole household were baptized. He also built a church over the spring dedicated to the Archangel Michael. Later, a young man named Archippus settled there and lived a life of austerity, in fasting and prayer. The pagans did many malicious things to Archippus, for they did not like the fact that this Christian holy place emanated such spiritual power and attracted so many people to it. The pagans, in their wickedness, rerouted the nearest river in order to flood the church and the spring. By the prayers of Archippus, the holy Archangel Michael opened a fissure in the rock beside the church, and the river's water plunged into it. This is how that place was saved and why it was called Chonae, or ``of the plunging,'' for the river's water that plunged into the open fissure. St. Archippus labored in asceticism there until the age of seventy, and peacefully reposed in the Lord.